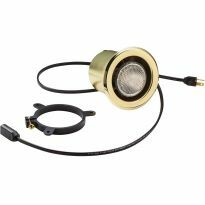 Wire up to six lights in a series. Mounting bracket eliminates the need to drive screws through the decorative ring and allows installation in cabinet panels of different thicknesses. 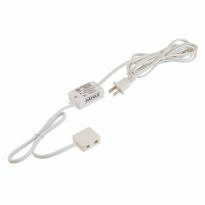 Plugs directly into household current without low voltage transformer. 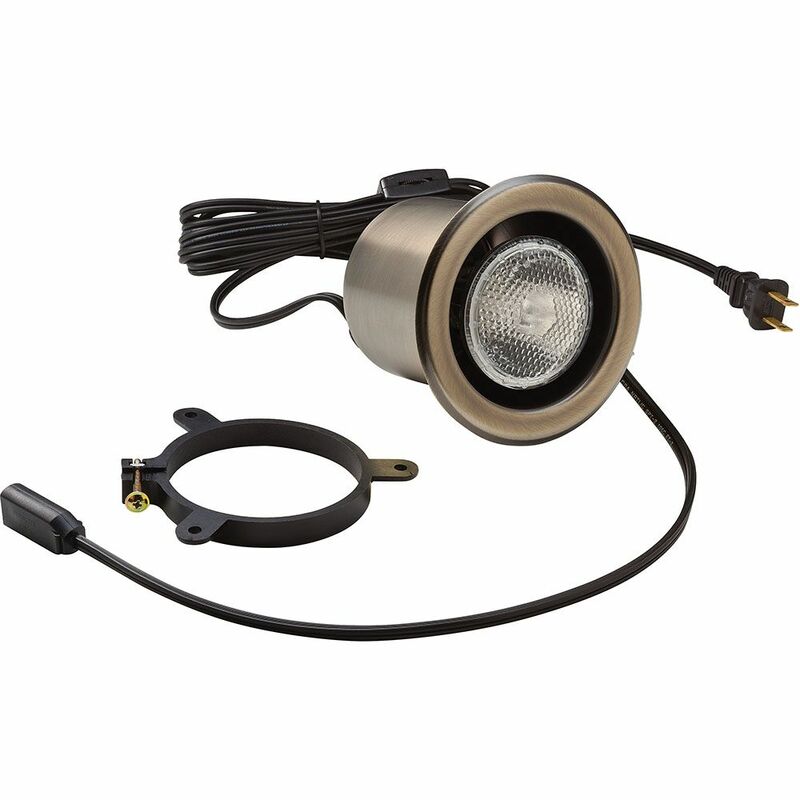 Wire up to six lights together with a master and five dependants. The master has a 10 foot cord, roller switch, conventional electrical plug and UL listed T-plug. Dependants have T-plugs on both ends of 24" long cords--an Underwriters Laboratory requirement for lights wired in series. 50 watt bulb included. Fixed beam. Mounting Bracket eliminates the need to drive screws through the decorative ring and allows installation in cabinet panels of different thickness. Top must be open to permit air circulation. Purchased for my curio cabinet. Fit very nicely through the hole on top of the curio. Sufficient length of cord to reach the outlet. Works perfectly as a replacement for my curio cabinet fixture. Looks wonderful and fits like a glove. Shipping was fast and well packaged. Would buy from again. This unit was used to replace a similar fixture in an existing curio cabinet. This unit was a perfect match and fit in the same hole. I would definitely recommend the quality. I needed a replacement light for my curio cabinet and this light was a perfect fit with a less than 5 minute install! 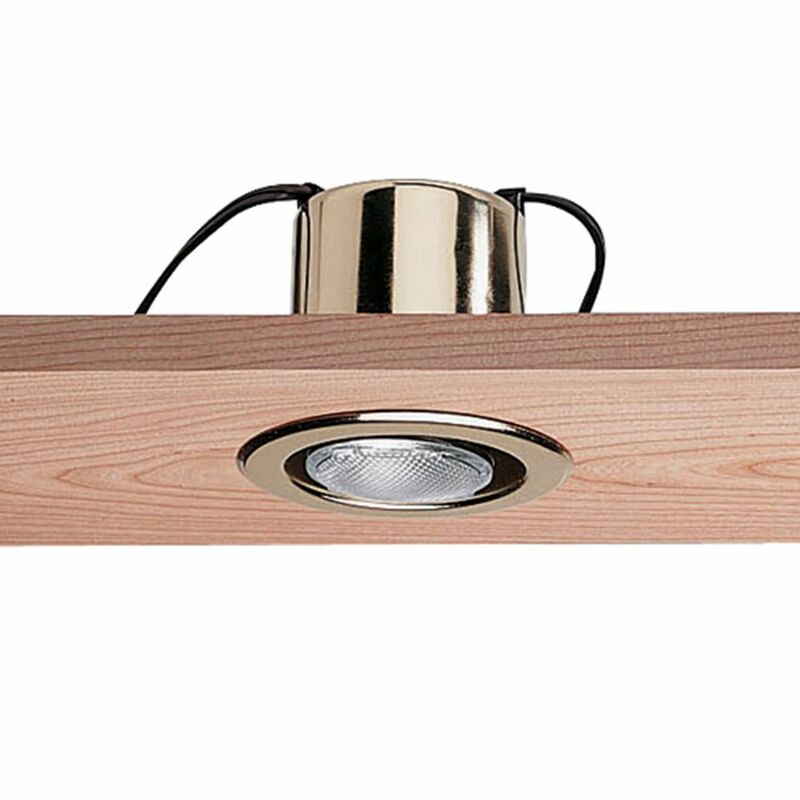 I chose the Halogen fixture to replace the incandescent one and the light is much brighter, burns cooler and suppose to be more cost effective. 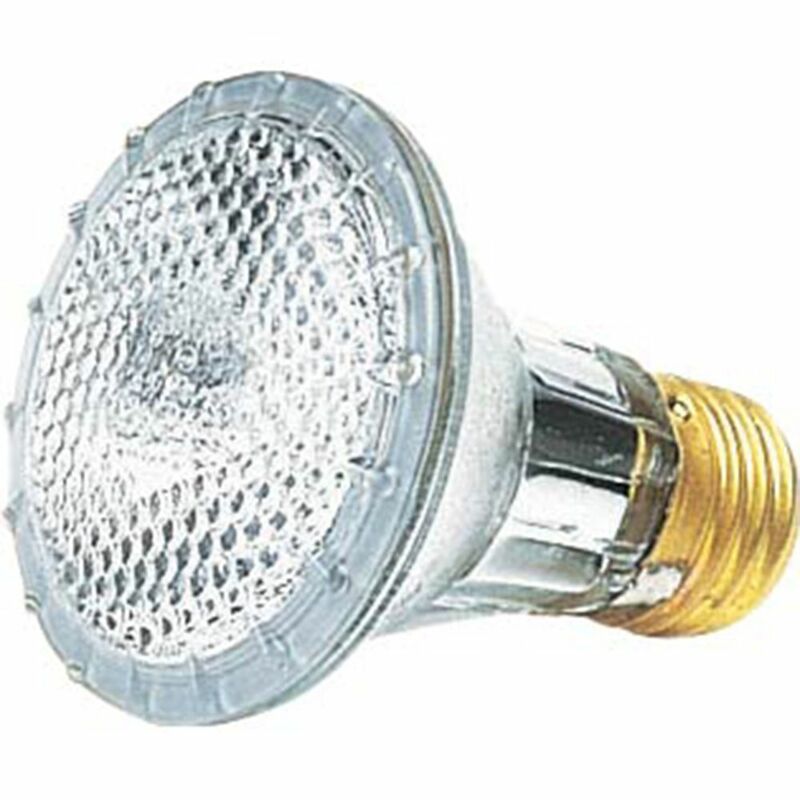 I've ordered another one to replace another light I have in another curio cabinet currently burning an incandescent bulb. I used the canister lights above a Murphy Bed I built. Lights were easy to install. They were perfect as I wanted strong light and had good ventilation for the halogen bulbs. I have a remote control switch stored on the headboard shelf with the RF transmitter behind the crown molding. Just the lights I was looking for! Installed in minutes. 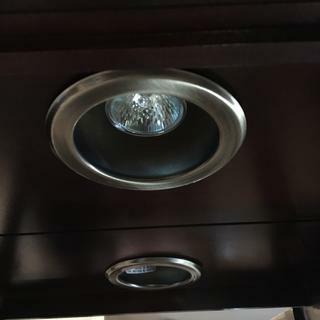 Perfect replacement lights for my wife's china cabinet. These lights are perfect for cabinet and shelf lighting. It's as described and it was very easy to install; however, the height of the canister is much higher than it needs to be and it shows above the curio frame. Don't know why they made the housing so high. I put the light in a tall corner cabinet. 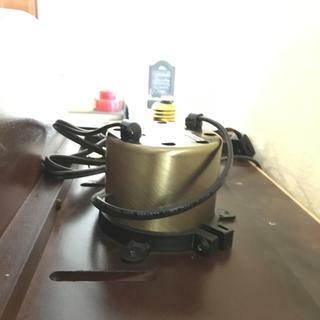 The cord is about eight feet long, but the switch would hang in the middle of the outside of the cabinet if I had used it unaltered. The light itself looks great and does a fine job of illumination. Looked identical to the light that I had in my curio cabinet that had stopped working. Great light for over the sink. Replacement light canister for our curio cabinet. 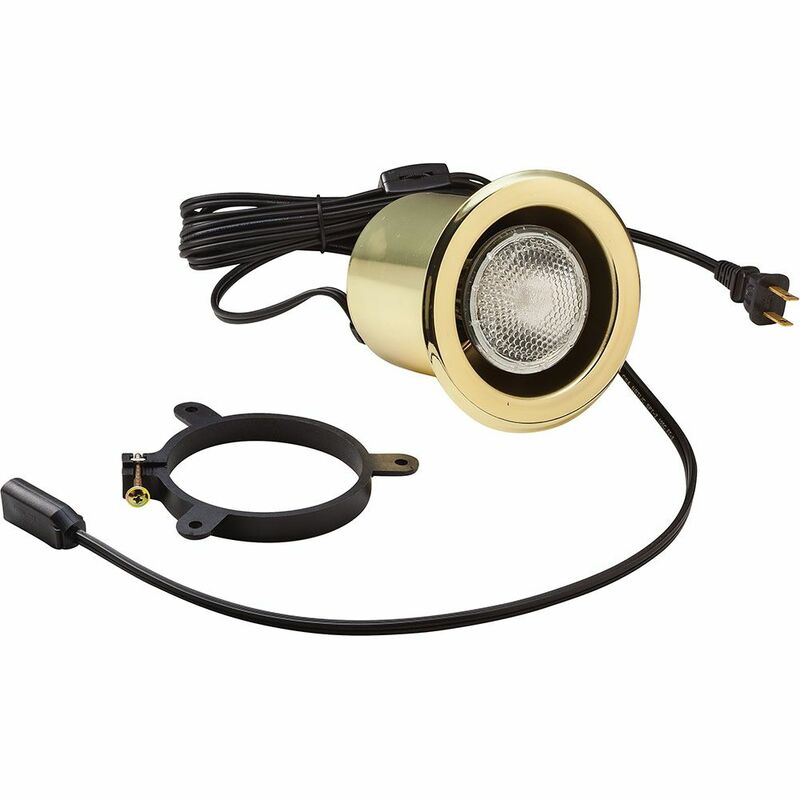 I would like to know if the 110 Volt Halogen Canister Lights-Master Lights can be dimmed? BEST ANSWER: Yes, I use an Insteon module and it dim's them fine. Any standard wall dimmer should be fine as long as you use Halogen bulbs. If you switch to LED bulbs make sure they are rated for dimming. We bought them for display cabinets and want them as bright as could be. I'm sure if you buy a dimmer you can plug the master lights into it. yes, and the results are impressive! Can these be mounted in the ceiling? BEST ANSWER: It has a corded switch, so the more practical use is in a curio cabinet. Can I wire these to an electrical circuit and light switch instead of plugging it into an outlet? BEST ANSWER: That's what I did. What is diameter of body? BEST ANSWER: The body diameter is 3 1/8". I would allow an extra 1/8" just for ease of installation. Hope this helps.